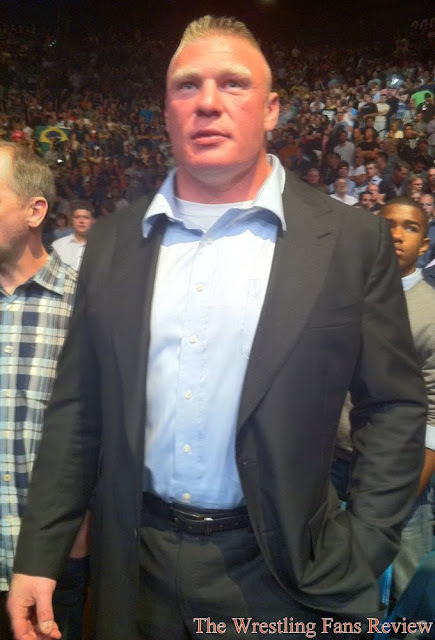 Brock Lesnar was in attendance at UFC 146. This is an odd appearance, because when he was an active MMA fighter he rarely attended fights as a spectator. This raised many rumors that the current WWE wrestler is fancying a return to the Octagon. UFC president Dana White helped fuel the rumor mill, when answering question during the post-fight press conference. When asked what Brock Lesnar was doing there, he answered with a smirk on his face and then a huge smile “I don’t Know, apparently now he is a big fan”. The follow up questions were; is there anything more to that, he answered “Yeah”, anything you like to share, White said “no, he was here I think that says it all.” The final question on the subject was, is there a chances he may come back, to which he answered “possibly, yeah.” Lesnar is under contract with the WWE for one year, but the WWE wants us to believe, Lesnar’s contract apparently allows him to persuade other ventures that may include a return to Octagon. In my opinion, Lesnar was there to speak with Dana White about a possible return to the UFC, but it will be after WrestleMania 29 which ends his contract with the WWE. I also believe that the WWE will use this free exposure to enhance the storyline between Triple H and Lesnar. The storyline is that Brock Lesnar has quit the WWE after his demands weren’t met, and having him seen in a live UFC PPV, will create an interest on his actual employment status. This is a great move on the part of the WWE & Lesnar.